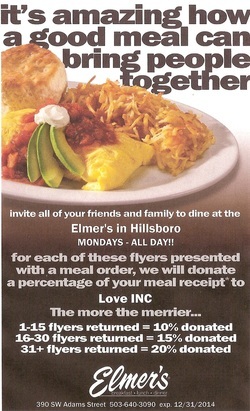 Each month a variety of terrific restaurants in the Hillsboro area have agreed to donate to Love INC a percentage from your meal receipt. Mark your calendar now & plan to eat a meal, enjoy the company & bless Love INC, too! Enjoy an Elmer's Outing and Support Love INC at the same time. Each order must accompany a copy of this flyer. Download and print as many copies as you need for your party.